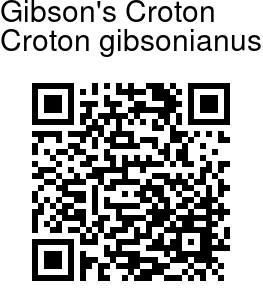 Gibson's croton is a large shrub or a small tree, up to 4 m tall. Branchlets are sparsely starry-hairy when young, hairless when mature. Leaves are simple, alternate, spirally arranged, stalk up to 5 cm long, blade 7.5-17.8 x 3.2-6.4 cm, elliptic-oblong, tip tapering, base rounded with 2-stipitate glands at the junction of stalk, margin minutely toothed, hairless or with a few stellate hairs, midrib raised above, secondary nerves 6-8 pairs. Flowers are unisexual, monoecious, male flowers often fascicled on 12-25 cm long slender racemes. 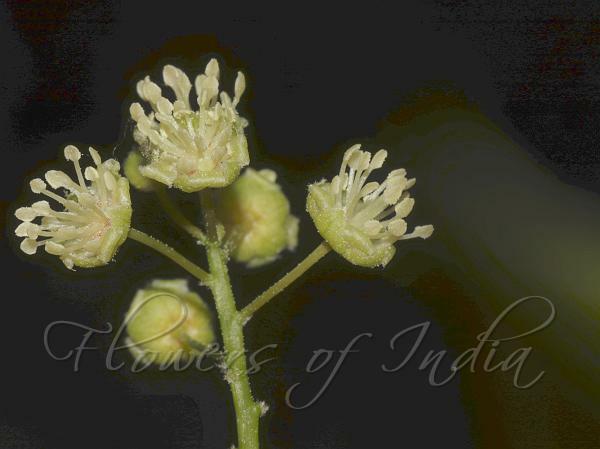 Female flowers are usually solitary and near the base of the raceme. Capsules are 3-valved, globose, densely stellate hairy; 3-seeded. Gibson's Croton is endemic to the Western Ghats. Identification credit: Tapas Chakrabarty Photographed at Agumbe Ghat, Karnataka.